The Hoxton Apprentice restaurant is a social enterprise set up by the charity Training For Life, but make no mistake, it is also a highly regarded restaurant that has received many positive reviews from most restaurant critics including Charles Campion and Fay Maschler. The food and service has been praised in Guardian, Independent, Time Out and Evening Standard to name a few. 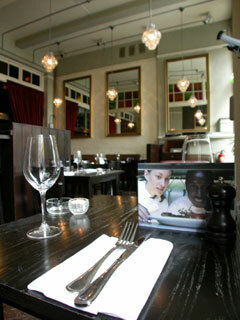 Tatlers Restaurant Guide 2005 named the Hoxton Apprentice as one of the top 320 restaurants in the UK. The restaurant occupies the ground floor, mezzanine floor and wide terrace in a Victorian building in the fashionable Hoxton Square. Leading restaurant designer Paul Daly kept as much of the original interior as possible, whilst adding his own design touches, creating a stylish, contemporary space. The relaxed ambience, a modern menu and excellent service, together with its admirable intentions has made the restaurant a popular spot for some of the celebrities. Managed by professionals but staffed partly by apprentices it provides training and work experience for people who have been unemployed for six months or more. It offers them real jobs on real wages that take them off benefits and provides in work support. The restaurant seats 60 in the main dining area on the ground floor. A mezzanine level seating a further 30 is great for private parties or special events. The venue is ideal to host buffet or canap� parties for up to 200, using the outside terrace, which opens onto beautiful Hoxton Square. It�s a fantastic space for al fresco dining in the summer. The Hoxton Apprentice now offers a wide range of corporate hospitality options with food and drinks packages tailored to your requirements, The restaurant is a wonderful venue for corporate entertaining and is a unique space for corporate and private events; receptions, lunches, dinners, meetings, conferences and presentations. You can either book the whole restaurant or a private dining space and exclusive use of the mezzanine room. The modern and eclectic menu offers seasonal and classics as well as some innovative made-in-here dishes. There's a good balance between fish, meat and vegetarian choices. For lunch you can enjoy the 2 courses set menu which leaves you satisfied without breaking the bank.